The idea behind this work was to test the capabilities of using a near-field communication (NFC) tag to store the information acquired through an analogue input of a microprocessor powered by an energy harvesting source. The capabilities of Peltier cells to harvest energy from differences of temperature between its two sides has already been studied in other posts starting with this link, so I will not develop this part of the work here. This is a continuation of my former post NUCLEO-L031K6 and ST-LINK SWD. What on earth did I do? in which I tried to flash a standalone STM32L031 and found some serious obstacles. Now, I have solved all issues that I found and I have been able to flash the darned MCU. The idea was to use the ST-LINK in a discovery kit with STM32L476VG MCU connected to the STM32L031 with only two pins, SWDIO and SWDCLK in the connector CN4 of the kit. The wiring is straightforward when every is tied and connected correctly. And I am stressing this because you have to be sure that you have connected all pins that have to be connected. 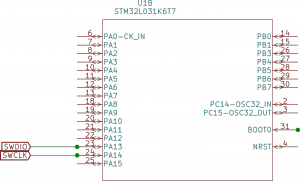 In concrete, pin 5 in the STM32L031 labeled as VDDA, the reference for the analogue inputs, is NOT internally tied to VDD in pins (1 and 17) so it HAS to be connected to power the MCU otherwise it would be pretty dead. 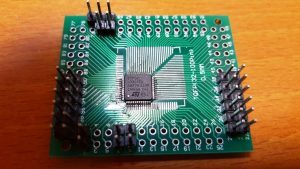 With this in mind, you only have to follow the next figures to connect the ST-LINK pins to the STM32L031. First, the power supply at 3.3 V and ground which are taken from the Discovery kit. Then the connections from CN4 to the MCU. Notice that I decided not to use the Vapp nor the SWO pins since they are not strictly necessary to flash a program. easily found on ebay. And, most importantly, I had a development board based on the same MCUs available from ST, NUCLEO-L031K6. I could test my program on the NUCLEO board and then flash it in the stand alone chip to know how much power consumption did I have. The power consumption can be estimated in the NUCLEO board but the process is awkward and probably not reliable since there are LED everywhere and currents are drained in unexpected ways. My problem was how to flash that stand alone STM32L031K6 MCU. I knew from the Arduino side that it is possible to program an MCU via a serial connection with Arduino UNO but it was difficult to find information about how to do it with STM32 products. The main reason is because most people use ST-LINK and do not need anything else. Well, I didn’t have an ST-LINK programming device (also found in ebay) and I wanted to accept the challenge of finding another way with the tools I had. The answer to a question I posted on the mbed discussion forum gave me some clues as how to proceed. There seemed to be an alternative to the serial port and it was to use the SWD (serial wire debugging) port with an external flash device. The ST-LINK uses the SWD to flash the target processor on a nucleo or discovery board and I could use the ST-LINK of any nucleo to flash an off-the-shelf processor as Wim kindly told me. I had a nucleo board! and… I also had a discovery board! mine was a discovery kit with STM32L476VG MCU, so I decided to give it a try. Continue reading NUCLEO-L031K6 and ST-LINK SWD. What on earth did I do? If a difference of temperatures of 20 ºC is achieved the voltage at the load would be 245 mV and it would draw a current of 109.4 mA, the maximum power would reach 26.8 mW when connecting a load of . Of course, all these data are hypothetical since the assumptions are in the most optimistic side considering that . Even under these circumstances a voltage booster would be needed to increase the voltage to a level according to the requirements of the MCU. For instance, the ultralow power STM32L432 ARM Cortex M4 requires at least a power supply of 1.71 V. There are two options to increase the voltage, using voltage multipliers or using DC-DC converters. These circuits use a combination of diodes and capacitors that allows to duplicate the voltage at the input in every stage. A common setup is the Cockcroft-Walton configuration as the shown in this paper to multiply the voltage obtained from events that create pulses that can reach peaks of 1 V or more. 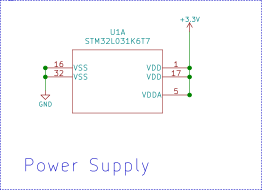 In the case of one or two Peltier cells connected in series, this circuit is out of the question since the Schottky diodes with the lowest forward voltage drop are close to 250 mV so they would consume the voltage provided by the cell or cells. Voltage boosters or DC-DC step-up converters would be the most feasible solution. The working principle is easy. The inductance L is charged closing switch S storing a magnetic field. This field will maintain the current flowing towards load R when S is opened. Since the inductance is giving energy to the load the voltage at L is effectively reversed and added to increasing the voltage at the output, . The switching should be done fast to avoid a total magnetic discharge of the coil when S is open and a total depletion of capacitor C when S is closed. The diode D prevents the capacitor from discharging through S.
This idea has been implemented in integrated circuits (IC) that scavenge small quantities of energy from the source, in our case the Pletier cell, to drive the switch and are able to increase the voltage at the output upto 3.3 V or 5 V depending on the MCU connected. Some examples of these IC and their behavior under real conditions are shown in the next post. With the setup described in the last post, the temperature of one of the surfaces of the cells can be controlled with an electrical current, the other surface is cooled passively with a heatsink. The resistors and the two temperature sensors are connected to the same voltage source taking advantage of the wide range of voltages supported by the LM35. The outputs of the LM35 are connected directly to two multimeters to measure the differences of temperature achieved between the two surfaces. Now, the process is easy: the resistors are heated with different currents and the output voltages of the cell and the temperatures are registered. This will solve the voltage source of the equivalent electric circuit of the cell in open circuit or the Thévenin voltage. 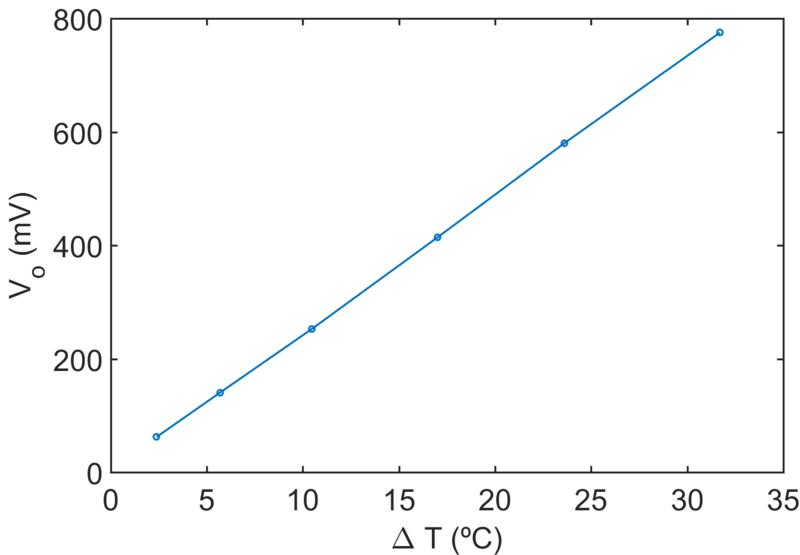 The results are represented in the next Figure showing a perfect linearity between temperature and voltage. Where, and are the current and voltage applied by the power supply to the resistors, respectively; is the output of the cell and and are the temperatures of the hot and cold sides of the cell, respectively. The plot shows that with the slope in V / ºC. The blue plot represents the voltage in open circuit, , and the red plot the voltage at the load, . Dividing this voltage by the load resistor yields the current given by the cell, . Therefore, the internal resistor is calculated applying Ohm’s Law knowing that the voltage drop is and the current is . This is done for several points along the experimental results in the plot giving a constant value for the resistor, . The same process is repeated for another cell of the same type and the result for differ from the first cell giving . 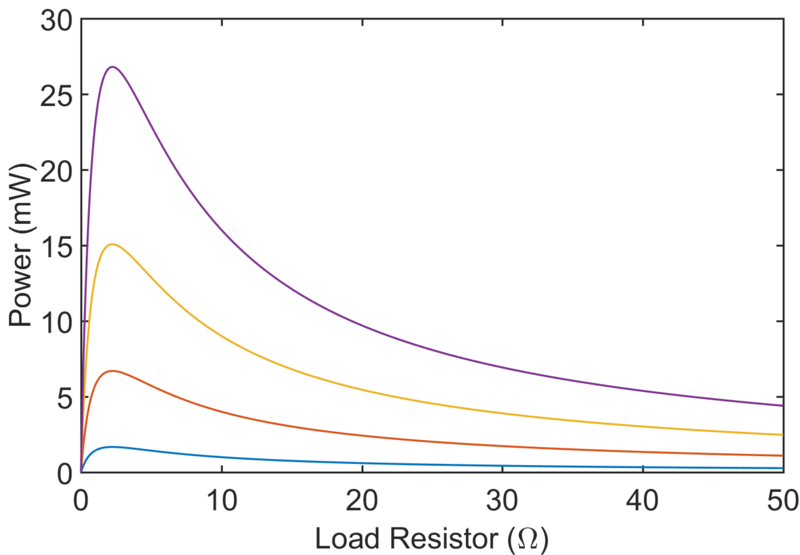 Even when the former internal resistor is double the latter one, the results have been re-checked and confirmed and are in agreement to other results found in the literature. Once the cell has been characterized, it is possible to determine the current that it will give to a known load. 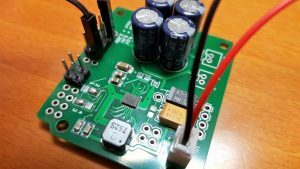 The next step is to devise a method to store the energy delivered by the cell or to explore the possibility of boosting the voltage to drive an MCU (microcontroller unit) directly. This will be explained in the next post. 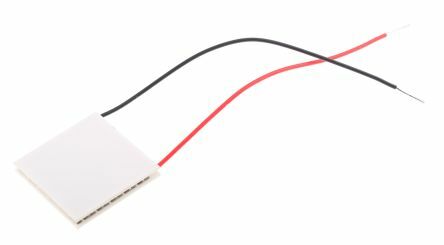 Peltier cells are usually applied to cool surfaces when connected to an electric power supply but they can also convert differences of temperature between their sides into a voltage, known as the Seebeck effect. Therefore, it is possible to have a voltage at the ends of the wires of a Peltier cell by applying heat to one of the sides and attaching a heatsink to the other side. In terms of energy harvesting, the heat should come from a residual source such as an electrical or mechanical machine or, simply, the sun using Fresnel lenses. The cooling of the other side should be passive to minimize the energy consumption, hence the use of a heatsink. 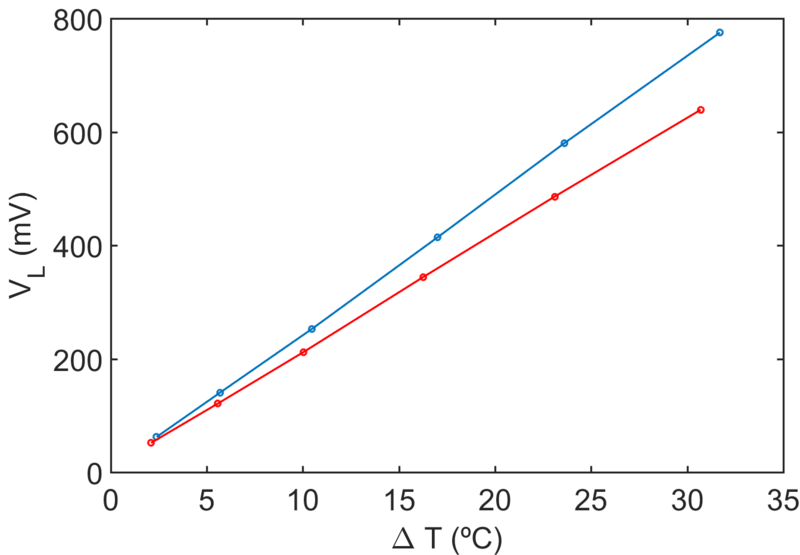 It is important to know how much energy can be obtained with a single cell as a function of the difference of temperatures, for this reason, the characterization of the cell must be the first step in the design of applications scavenging energy. The mounting scheme is shown in the side Figure where the heatsink is clearly seen on top of the cell. This is hidden by some pieces of thermal insulating foam but the two wires are visible. Finally, an aluminium plate has been adhered to the cell with a thermal conductive bonding paste. The aim of this work is to obtain the Thévenin equivalent of an Adaptive ETH-071-14-15 Peltier cell but the process is valid for any other type of cell. The datasheet details the working curves when the cell is used as load but nothing is said about its characteristics when used as a source. 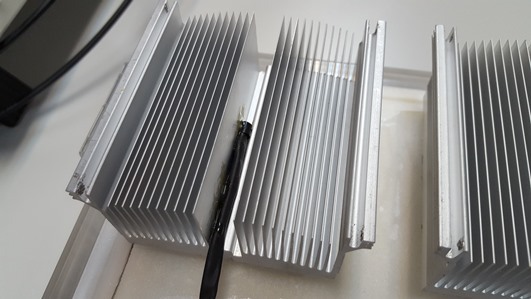 The characterization requires the application of a known difference of temperatures, ΔT, and this is achieved injecting current to a pair of ceramic resistors of 47 Ω in parallel attached to the aluminium plate with silicone. Two LM35 temperature sensors read the temperature of the aluminium plate and the heatsink. 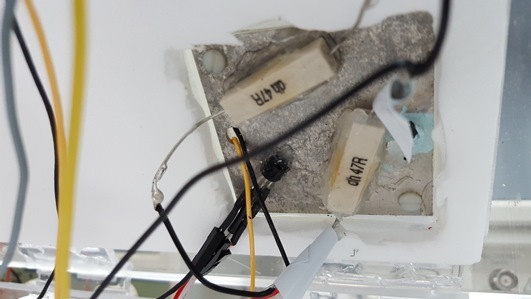 Notice that, once the plate and the heatsink are attached to the cell, its sides are no longer reachable so the sensors have to be connected to the closest surfaces to the cell. There will be an uncertainty in the measurements but we can asume that it is negligible or, at least, that it affects the two sensors in the same manner so the difference of temperatures is the same as in the surfaces of the cell. The mounted cell is enclosed in methacrylate box coated with thermal insulating panels ensuring that, once a constant difference of temperatures, ΔT, is achieved, it is maintained along the experiment so the output voltage can be directly related to the selected ΔT.